Sapna was just turning 7. Her parents had inculcated social values in her from a small age. She wanted to plant an apple tree on her birthday, But she was clear - she wanted to plant a 'big apple tree' that can bear fruits quickly..Will she get one? or will she help all of us learn some beautiful lessons of life? 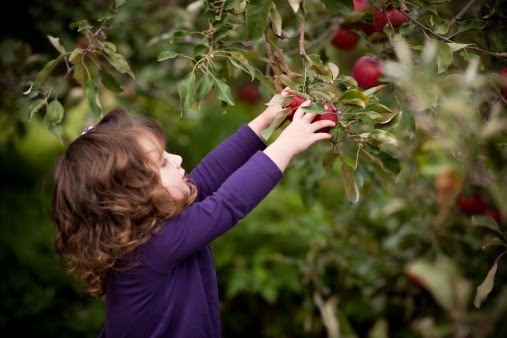 "Dad, I want to buy an apple tree this time on my birthday. I do not need any other special gift. ", said Sapna in a firm and determined voice to her dad. "Oh sure baby, and that is so nice of you to think so unselfishly about the environment." "When can we go Dad?" "Let us go right now." And off we went. My sweet heart was turning 7 today. Both me and Priya had been teaching her the importance of working for the society and contributing in whatever ways we can. She had understood that she should leave this planet a better place than what she has inherited. And this seemed a good first attempt in doing so. "Dad, I want a bigger one...these ones are too small." said Sapna after looking at all the options that the nursery caretaker showed her. "Sapna, this is what you will get for planting. You cannot get a tree bigger than this. You will have to put in efforts to make it big." "Let us try some other nursery Dad. I want a tree which is ready to bear apples." "Dad, why can't I get a big one?" Sapna asked sipping in her mango drink as she felt frustrated for not getting what she attempted. "Sapna, as I told you, you will get only a small one, but you will also get an opportunity to grow it big. You will have to nurture it by watering it everyday, protect it from animals and other storms that might come, feed it with proper manure and food, and put your sweat onto it by tilling the soil, pruning it at regular intervals - you will have to do all this to make it big enough to be able to bear fruits. It is not easy." "hmm...Seems too much of an effort..."
"But in the end it is worth it. And, you know what, this is exactly what happens in our life also, dear"
"Means, how come this happens in our life Dad?" "Whenever we want something worthy, whenever we have a big dream, whenever we want to change lives of people around us, we don't get it in a platter. We always have to start small, and then nurture that dream everyday." "and how do we nurture the dream everyday?" "By reading great books, associating with positive and like minded people, disassociating from time stealers, - that's the food for our dream. Not only that, just like the apple tree, you have to protect your dream as well." "Protect? Why do we need to protect? Who will eat our dream Dad? C'mon. Are there people who eat our dreams?" She said sarcastically. "There are more than enough people who can steal your dream baby. Just like the gazing animals against whom you protect your tree, so many times, there will be your close family members and friends who can steal your dream away or destroy it. Just like you need to protect your tree against the inclement weather, there will be situations in life which can potentially destroy your dream. You need to fiercely protect your dream from all such entities. You need to be very very careful and always alert to protect it." "And I can guess what you would mean by putting our sweat into it to grow it big...you would mean to say that we need to work very hard to fulfill our dream..."
"You got it Sapna. And then the tree would one day start bearing fruits - after which Nature would take care of it - you dont have to really do anything after that. And for years and years - it will feed the world around it. It will produce hundreds of apples and each apple will have tens of seeds - each capable of converting to the same tree - provided we have someone who can nurture, protect and toil hard all over again." I was more relaxed now, resting my back in the comfortable chair at the coffee shop, and sipping in the last sip of coffee. It was almost time to leave for home. We were back in our car. I looked at Sapna, who was on the adjacent seat as I drove. She was thinking hard. "OK Dad take me back to the nursery where we have a small tree. I will buy the small one - and as you said - nurture it, protect it and toil hard to make it big enough to yield fruits. And one day, you will see an orchard here...."
We did a high five !! Life's biggest lessons are so easy to inculcate in our children provided we have the time to spend with them and make them experience real life. Teach them how we can learn from every small incident.